An image of Pluto and Charon taken on July 13, 2015, by the Ralph instrument on NASA's New Horizons spacecraft, using three filters to obtain color information, which is exaggerated in the image. 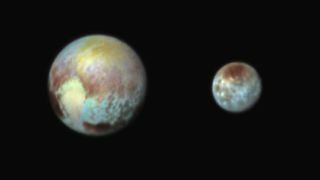 These are not the actual colors of Pluto and Charon, and the apparent distance between the two bodies has been reduced for this side-by-side view. Flamboyant yellows, purples, blues and greens cover the surfaces of Pluto and its largest moon, Charon, in new images from NASA's New Horizons space probe. The surfaces of Pluto and Charon don't actually look like the inside of a kaleidoscope; if you saw them with your naked eye, they'd appear much more monochromatic. But the new false-color images reveal the identity of various chemicals across the surfaces of the two bodies, and can help scientists uncover the history of this far-out family of objects, researchers said. The flamboyant new photos were captured using three color filters on New Horizons' Ralph imaging instrument. They were taken on Monday (July 13) before the probe went quiet, as planned, in preparation for its close flyby of Pluto at 7:49 a.m. EDT (1149 GMT) today (July 14). Looking at false-color images such as these can help scientists determine the molecular makeup of ices and determine the age of geologic features (such as craters), NASA officials said. Such analyses could also reveal changes that have occurred on the surface of the two bodies due to space weather. "We make these color images to highlight the variety of surface environments present in the Pluto system," Dennis Reuter, co-investigator with the New Horizons Composition Team, said in the same statement. "They show us in an intuitive way that there is much still to learn from the data coming down." One of the most striking Pluto features revealed by New Horizons is a 1,000-mile-long (1,600 kilometers) bright region shaped like a heart. The new false-color images reveal that the heart, which looks monochrome in other pictures, consists of two regions with different colors. Charon's surface has been full of surprises so far; it contains chasms and craters, and a dark north-polar region. In the new false-color photos, the dark pole appears red, which is attributed to "hydrocarbon and other molecules, a class of chemical compounds called tholins," according to NASA. "The mottled colors at lower latitudes point to the diversity of terrains on Charon." The New Horizons probe will send back not only stunning new images of the Pluto system, but also incredible scientific data about the dwarf planet's atmosphere, surface composition, geologic activity, size and more. The false-color pictures show hhow the instruments onboard the probe can provide insight into the nature of these mysterious members of the solar system, mission team members said.